Virtually none of these approximately 10 million Americans will be buying a new home this year. 40 percent of student loans are delinquent or in default. The overall labor force participation rate has fallen steadily during the jobs recovery. Despite a rise in the prices of existing and new homes to pre-housing crash levels, new home sales in the United States remain mired at levels below those in the 1960s and 1970s when the population was approximately 40 percent smaller. Existing home sales have improved but remain far from the 2005 peak. An often cited rationale for lower existing home sales is a lack of inventory. Citing low existing home sales because of an inventory shortage is an excuse for a poor housing market that reflects a poor economy. If there is a shortage of existing home inventory, one might think that new home builders would be busy trying to supply inventory to the market to make up the supposed inventory shortfall. 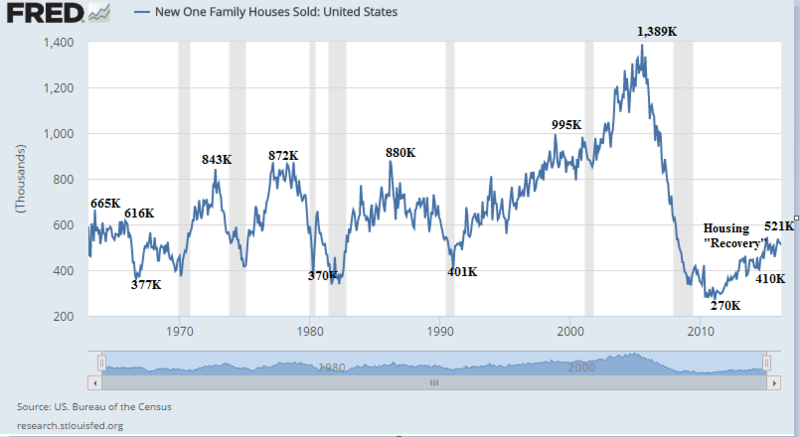 Chart source: U.S. Bureau of the Census, New One Family Houses Sold: United States, retrieved from FRED, Federal Reserve Bank of St. Louis May 24, 2016. New home sales between 2010-2016 are at best comparable to the those of the 1960s. Nearly 10 million Americans with government backed student loans weren’t making payments as of Jan. 1, 2016. According to The Wall Street Journal, 43 percent of the 22 million Americans with federal student loans were not making payments for one reason or another. About 16 percent, or 3.6 million, were in outright default in the aggregate of $56 billion in student loans. Another 14 percent, or 3 million, were at least a month behind on their payments, which in the aggregate total $66 billion. Yet, another 3 million Americans with student loans have some type of permission to suspend payments due to inability to pay usually because of unemployment. If 43 percent of those with student loans are in the circumstance where they can’t pay, how many are close to not being able to pay and ready to throw in the towel and stop paying? A fair estimate might bring the total from 43 percent to more than half. Of the ones that can afford to pay their student loans, how many can afford to also buy a new house? The new home sales figures of the past six years indicate far fewer than in prior decades. Millennials are currently in their prime working years. Not only are they saddled by massive student loan debt but also as a group are working and earning less. US. 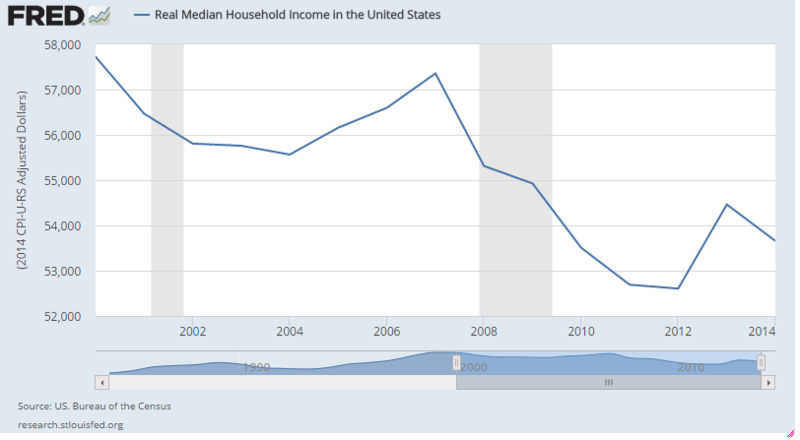 Bureau of the Census, Real Median Household Income in the United States retrieved from FRED, Federal Reserve Bank of St. Louis, May 30, 2016. Median household incomes have not risen since the end of the Great Recession while new home prices have soared to record highs. Another reason that the housing recovery hasn’t led to a healthy increase in new homes sales is the weakness of another recovery — the job market recovery. Despite the unemployment rate dipping from double digits at the height of the Great Recession to about 5 percent today (in part because people who have given up on working are no longer considered unemployed even though they are not working) for those working, income gains are tiny. The myth that the labor force participation rate is declining because of retiring baby boomers. 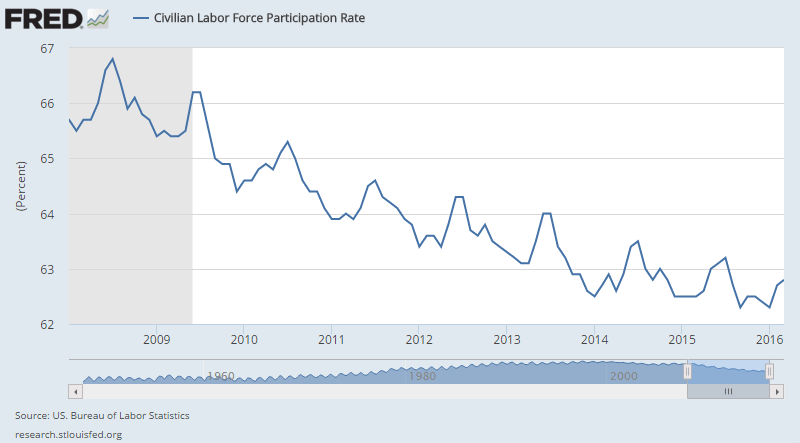 In “Why The Job Recovery is a Farce” published in March 2015, we showed that the labor force participation rate was falling. The pace of decline in the labor force participation rate, however, was greater for those in their prime working years. The only group that showed an increase in the labor force participation rate were those aged 55 or older with the most pronounced gains for those 65 and older. In “Why the Job Recovery is STILL a Farce,” published in November 2015, we showed that the trend of older workers postponing retirement by remaining in the work force or coming out of retirement continued while the labor force participation rate of those in their prime age working years was at its lowest level since the early 1980s. The same low rates that have helped drive home prices higher also destroyed the ability of retirees to live off interest on their savings, hence the increased baby boomer labor force participation rate. The labor force participation in early 2016 is still hovering at levels last seen in 1979, when fewer women were in the labor force. The often cited reason for a decline in the overall labor force participation rate is that baby boomers are retiring and driving the percentage of people attached to the labor force lower. A review of the labor force participation rates by age groups shows that not to be the case. Most troubling is the labor force participation rate of those in their prime working and homebuying years (25-54) has declined during the “job recovery” of 2009-2016. US. Bureau of Labor Statistics, Civilian Labor Force Participation Rate, retrieved from FRED, Federal Reserve Bank of St. Louis, April 18, 2016. US. Bureau of Labor Statistics, Civilian Labor Force Participation Rate: 20 to 24 years, retrieved from FRED, Federal Reserve Bank of St. Louis, April 18, 2016. The labor force participation rate for those 20-24 is lower in 2016 than the great recession. US. 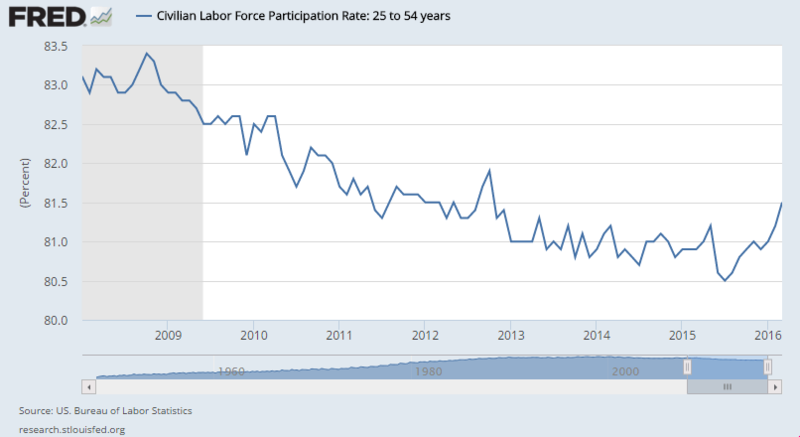 Bureau of Labor Statistics, Civilian Labor Force Participation Rate: 25 to 54 years, retrieved from FRED, Federal Reserve Bank of St. Louis, April 18, 2016. Although the labor force participation rate for those aged 25-54 has increased in 2016, it remains lower than the rate during the Great Recession of 2008-2009. US. Bureau of Labor Statistics, Civilian Labor Force Participation Rate: 55 years and over [LNU01324230], retrieved from FRED, Federal Reserve Bank of St. Louis https://research.stlouisfed.org/fred2/series/LNU01324230, April 18, 2016. The labor force participation rate among those aged 55 and older is higher in 2016 than it was during the Great Recession of 2008-2009. US. Bureau of Labor Statistics, Civilian Labor Force Participation Rate: with No Disability, 65 years and over [LNU01375379], retrieved from FRED, Federal Reserve Bank of St. Louis, April 17, 2016. 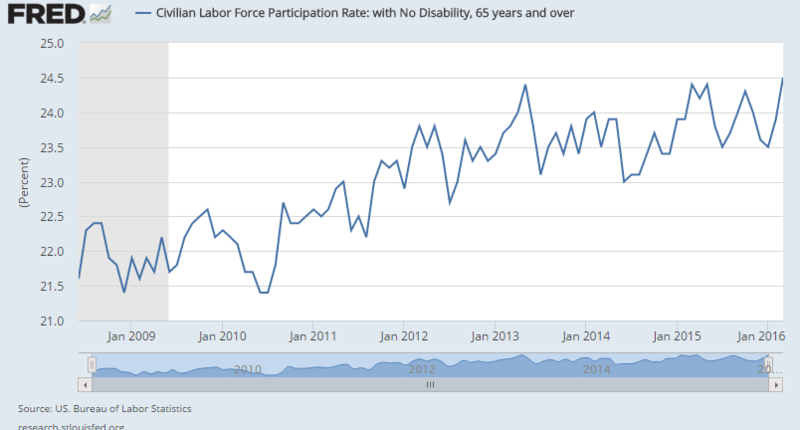 The labor force participation rate of those aged 65 has increased from about one in five in 2009 to nearly one in four in early 2016.3. Record high new home pricesNew home prices hit a record high in early 2016. Bureau of the Census, Median Sales Price for New Houses Sold in the United States, retrieved from FRED, Federal Reserve Bank of St. Louis, May 29, 2016. 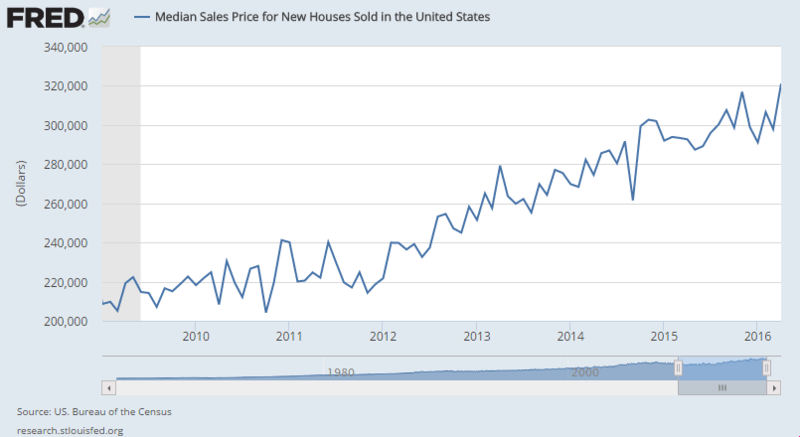 New home sale prices have risen steadily since the Great Recession of 2008-2009 and hit an all time high in 2016. Many cheer on rising home prices, but there’s a dark side to higher home prices — unaffordability. Record high new home prices and a lower percentage of those in their prime homebuying years attached to the labor force — many of who are defaulting on their student loans — have kept home sales at levels that could hardly qualify as one associated with a housing recovery.